A member of the brassica family of vegetables, Romanesco is sometimes called Romanesco broccoli, Roman broccoli and sometimes Romanesco cauliflower. It certainly has the taste of cauliflower raw when I tried a bit as I started cooking. What appeals to me is the wonderful lime-green colour and most amazing spiral florets that look like something that might have been painted by Escher, who was known for his mathematically inspired artwork. Doesn’t it look just amazing! 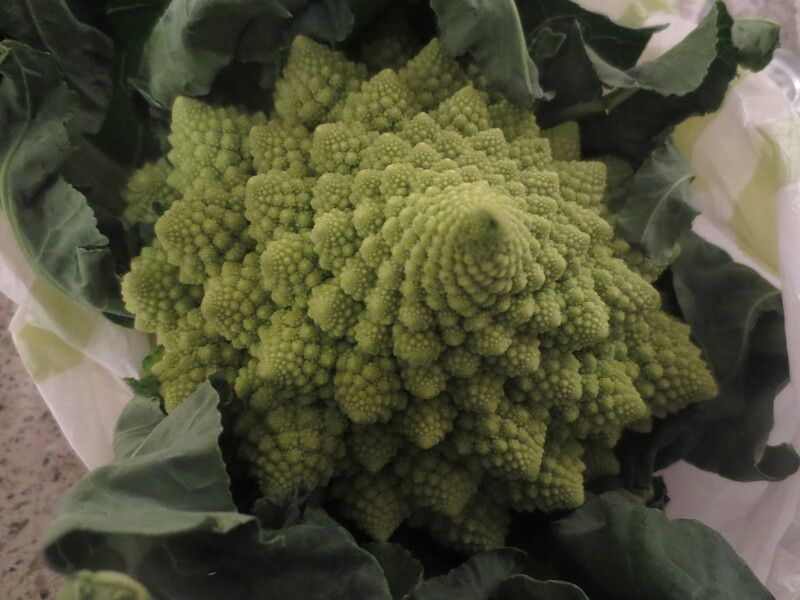 Romanesco was first cultivated in Italy in the 16th century. I remember being so taken by a crate of it in a stall in Rome when I was last there that I took this photo. Of course the one I cooked tonight hadn’t travelled so far. 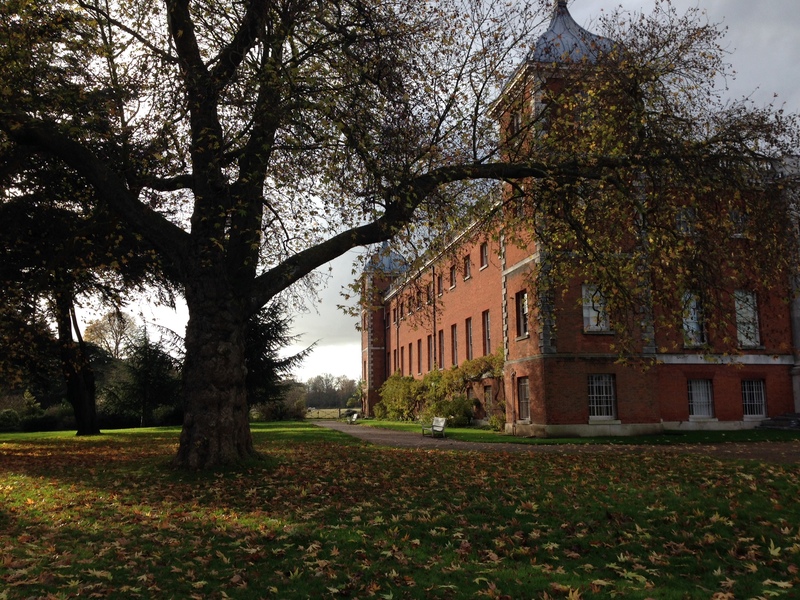 Well, it might have done if I’d bought it in a supermarket (I’ve never seen one in a supermarket) but I bought it in a farm shop at the National Trust’s Osterley Park & Gardens on Sunday, where I’d gone for a walk and managed to just avoid getting caught in the rain. 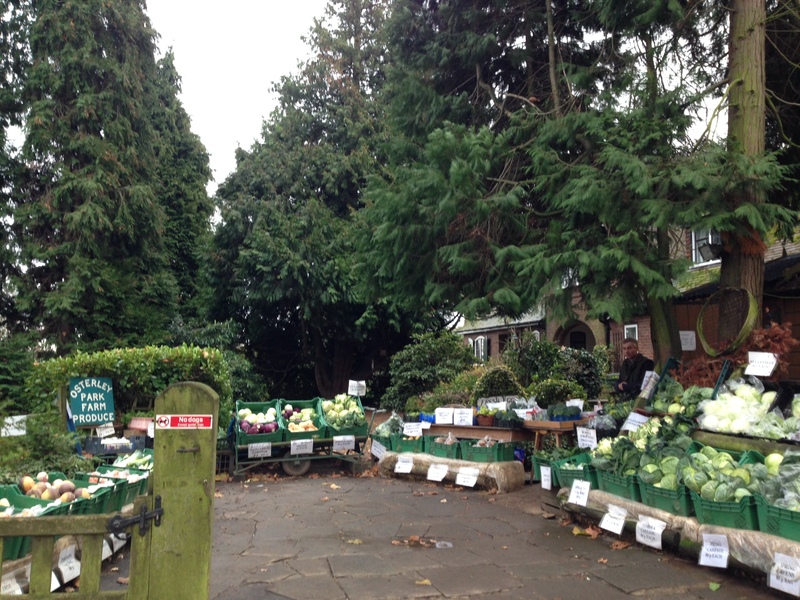 I’ve seen them recently in my local farmers’ market and as they’re in season now, I’ve come across some ‘Christmas’ recipes for them. Although I was excited by seeing the display in Rome nearly three years ago, I had seen them before – but not often. They seem to be finding popularity here now and one can see the appeal: isn’t nature just wonderful to come up with a vegetable that looks like this. 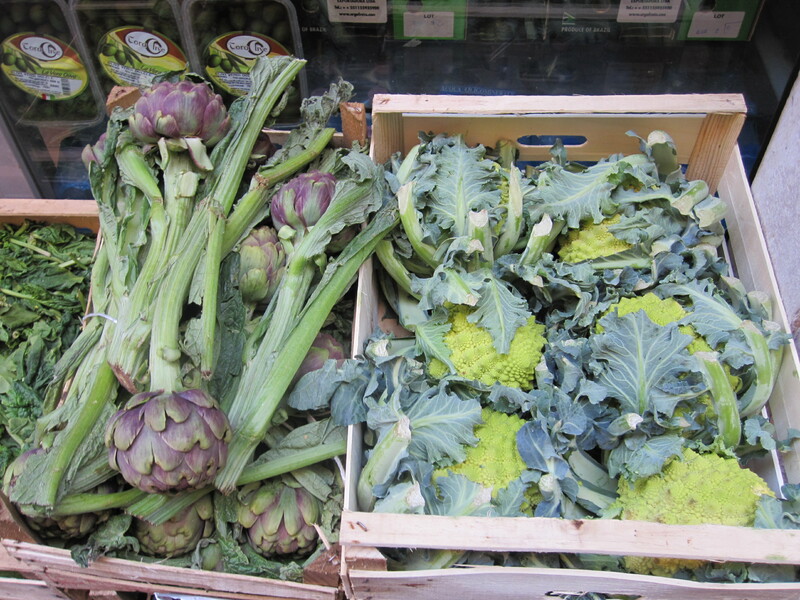 Cooked, their taste lies somewhere between broccoli and cauliflower but is more delicate, nutty and sweet. You could use it for any recipe where you’d normally use cauliflower and it’s popular made into a pasta sauce in Italy where broccoli might normally be used. I wanted to cook it fairly simply and serve with the rest of the wonderful Italian sausages I bought at Corto Italian Deli last week (click here), and which I’d been storing in my freezer. 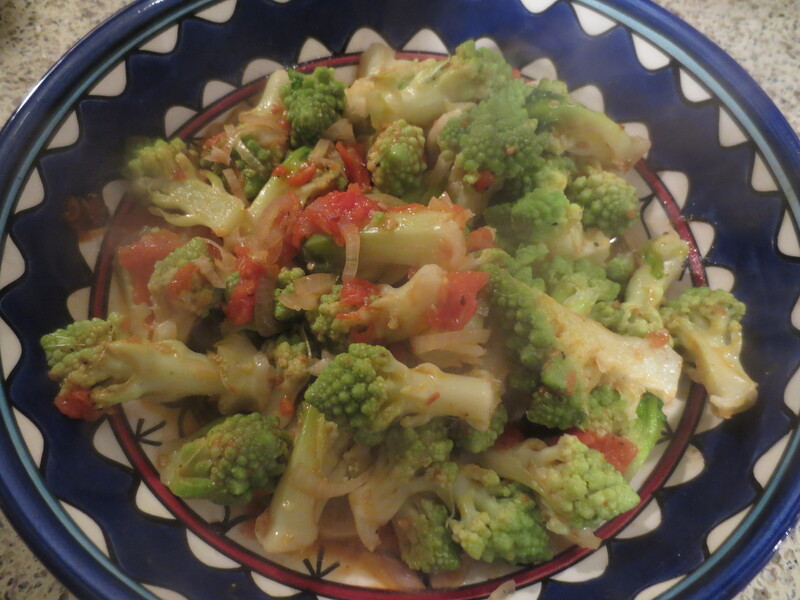 I decided to lightly boil the Romanesco and make a sauce of fresh tomatoes, anchovy, garlic and chilli for it. 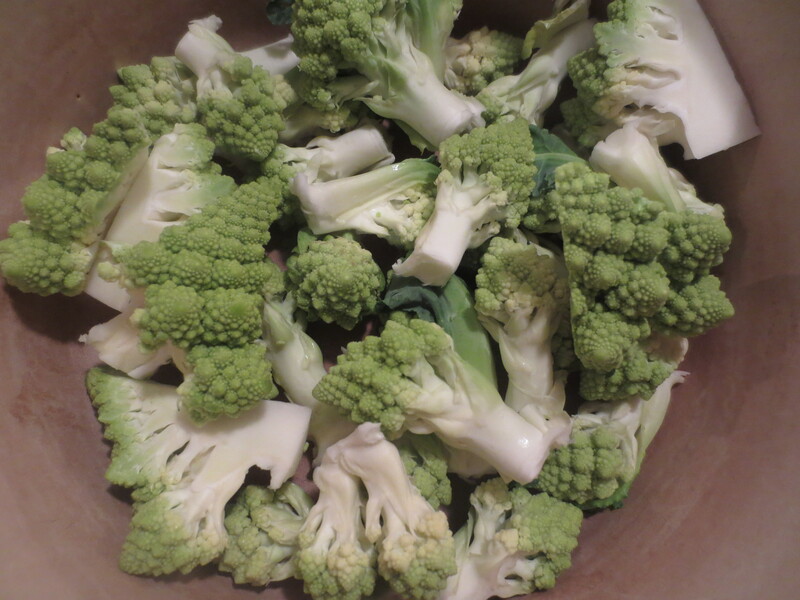 The Romanesco florets broke away easily from the base and I put them in a saucepan with just enough water to cover, salted them, brought to the boil and simmered until just tender but still with quite a bite. Then I drained them, reserving a little of the cooking liquid. Meanwhile, in a large frying pan, I gently fried 1 shallot sliced, 1 small garlic clove slice, 2 anchovy fillets and a good pinch of dried chilli flakes. 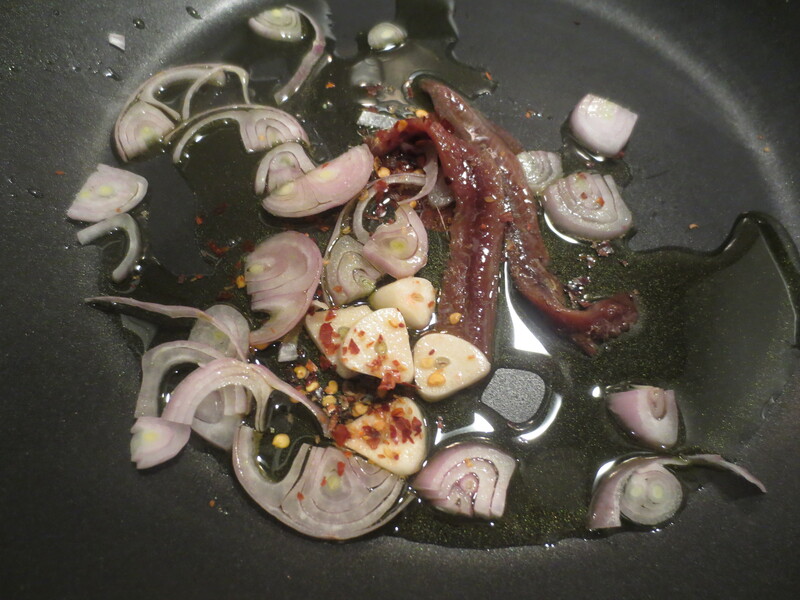 Anchovies are often used in Italian sauces to bring depth of flavour and saltiness (I didn’t need extra salt for this dish), but don’t make it fishy. They soon break up as they heat and if you stir them and mash them down a bit, they just mix well with the other ingredients. Once they’re all well underway and starting to soften and cook through, add some chopped fresh skinned tomatoes and a good grating of black pepper. 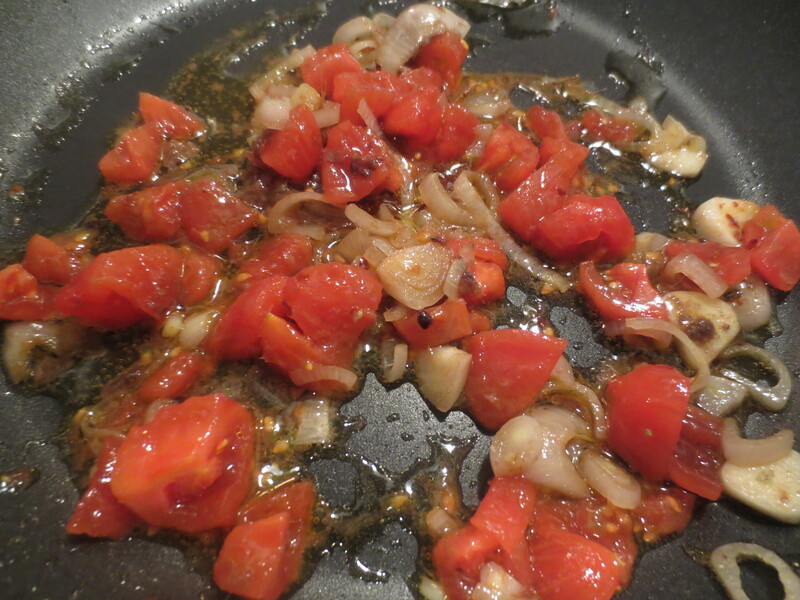 I only had small tomatoes in my fridge so used 4; otherwise use a couple of medium-sized ones. Once the tomato breaks down a bit add the drained Romanesco florets. 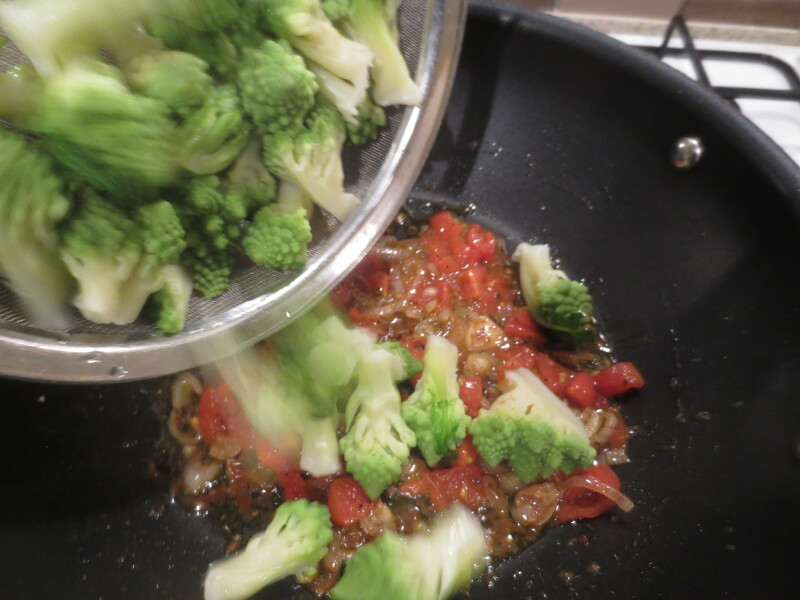 Mix together well and add a little of the reserved cooking liquid from boiling the Romanesco. Let it bubble gently away for a couple of minutes or so, so that the Romanesco takes up the flavour of the sauce a bit. But don’t let it go soft. When ready, tip into a serving dish. I then grated over a good showering of Parmesan cheese. I had been grilling my sausages meantime. I’d decided not to serve any other vegetable or pasta with it but just some good country bread I had. 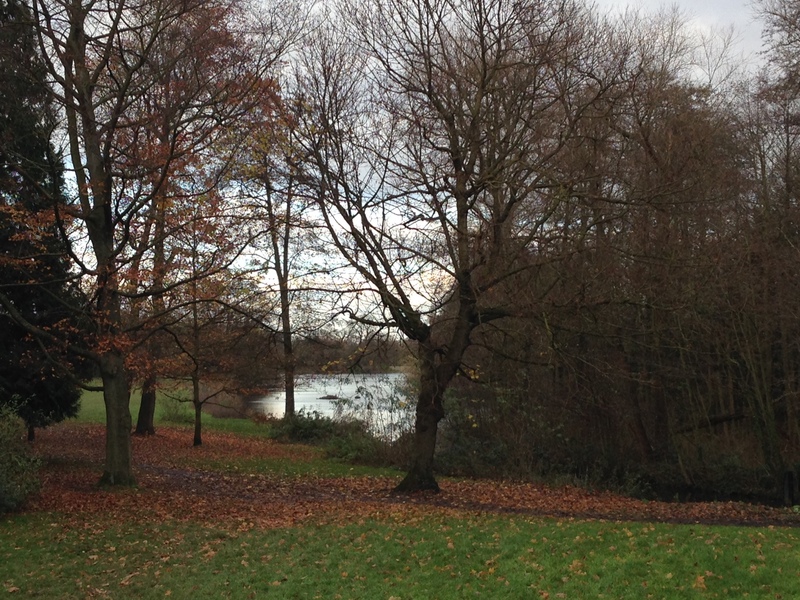 It was really wonderful (so were those sausages too!). 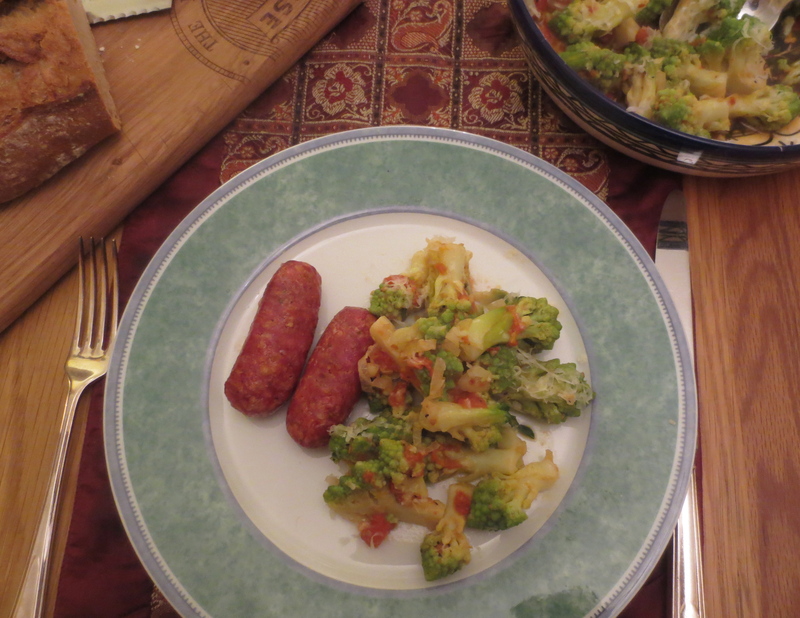 The Romanesco florets were cooked through but still retained a good bite. 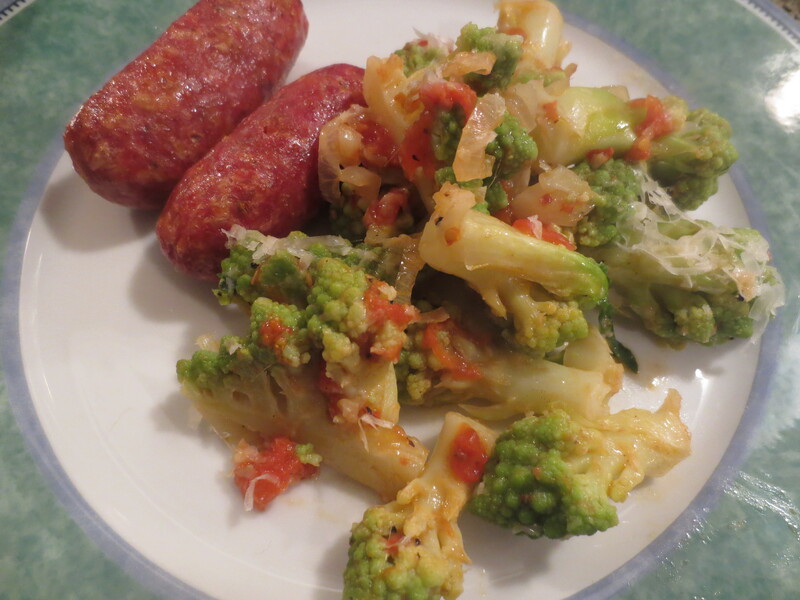 The accompanying sauce enhanced the Romanesco’s lovely flavour but didn’t overwhelm it. 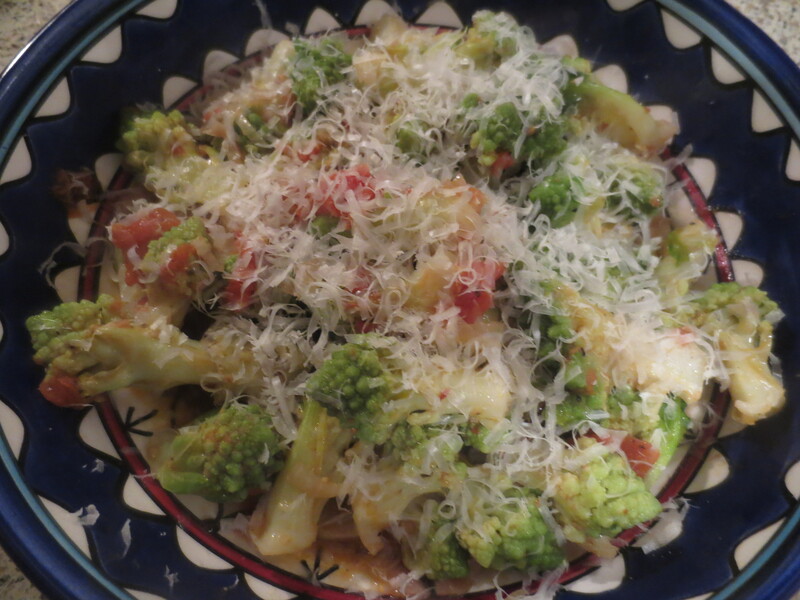 I’m definitely a fan of Romanesco and have got a good portion left over which tomorrow I plan to very gently re-heat and then mix with some freshly cooked orecchiette pasta for a quick supper – a good Puglian-style pasta dish. I’ve had romanesco while traveling in Europe but I’ve never seen it here in New England. Love your preparation…I’m sure it was delicious with the sausages. Thank you, Karen. Romanesco isn’t easily found here – except now in the farmers’ markets, but it’s quite special and makes a pleasant change from broccoli or cauliflower.